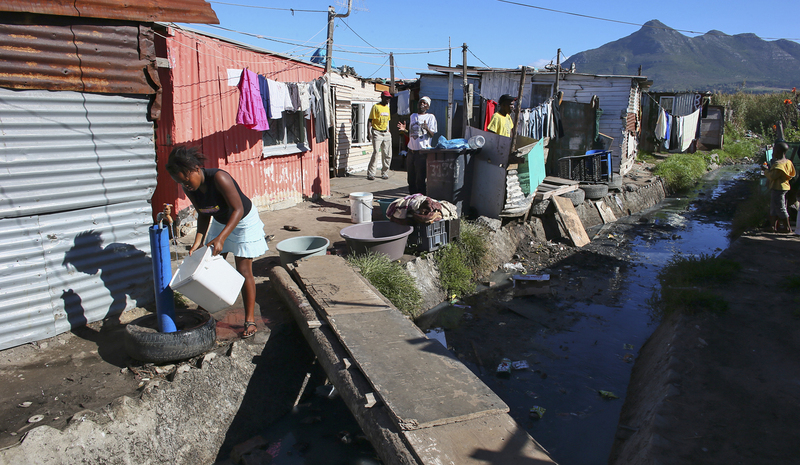 Cape Town vs Civil Society: How much is enough spending on water and toilets? Every year the City of Cape Town produces a draft budget the size of a packing crate. While the public is invited to make submissions on how the city’s money gets spent, the sheer size of the document alone makes engagement daunting. NGOs have done the work, however, and they say Cape Town’s 2015/16 budget reveals that proportionally far too little is being spent on infrastructure in informal settlements. The City of Cape Town begs to differ. By REBECCA DAVIS. Activists from the Social Justice Coalition (SJC) and Ndifuna Ukwazi are far from convinced. At a meeting on Tuesday hosted by the International Budget Partnership – an NGO supporting public participation in government budgets – their concerns were laid out. The City says its budget is 67% pro-poor. Activists are calling the City’s budget “unfair”. “It’s not as if the City is having to shrink its budget… it’s actually spending more and more,” says Ndifuna Ukwazi’s Jared Rossouw. The spending on utilities generally is up to just over 50% of the budget. It is the public money budgeted for water and sanitation, however, which is the particular focus of these NGOs. While the City presents the fact that it is budgeting R503.7 million on services to informal settlements as evidence of its ‘caring’, activists say that figure conceals how little is being spent on capital allocations to build water and sanitation infrastructure in informal settlements. The SJC’s Axolile Notywala pointed out that for Cape Town’s 204 informal settlements in 2015, only R22 million is being budgeted for capital allocations for water and sanitation infrastructure – in other words, the money to carry out projects such as building full-flush toilets and connecting informal settlements to the sewer system. Notywala says this amount is less than that spent last year. But elsewhere in the city, the total capital allocations for water and sanitation infrastructure are rising. Of the total water and sanitation capital budget, the amount being allocated to informal settlements is less than 2%. Activists say it cannot be considered equitable that 20.8% of all households in the city are informal, but receive less than 2% of the spending for water and sanitation infrastructure. “You’d want to see the same spending across the city, if not more [to informal settlements] to compensate for past infrastructure choices,” Rossouw says. For their part, City representatives say the NGOs are being deliberately disingenuous by focusing only on the capital allocations budget as opposed to the amount spent providing daily services to the residents of informal settlements. In response, Rossouw defended the NGOs’ focus on the significance of capital allocations. How does the City defend the fact that direct capital allocations to informal settlements for water and sanitation are decreasing, when the total capital allocations for water and sanitation across the City are increasing? Herron blames that on the fact that informal settlements are often on land where infrastructure cannot be built. “Full-flush toilets cannot be installed on privately-owned property, in areas of extremely high density, under power lines, on landfill sites, in a road or railway buffer, within servitudes, outside the Urban Edge, in areas where there is no bulk infrastructure, in water bodies/retention ponds and floodplains, and in high-noise zones,” Herron said. He gave the example of the City installing infrastructure in a floodplain, whereupon there would be increased risks of malfunction and a concomitant increase in environmental health hazards like sewage spills. To install permanent full-flush toilets in the contexts mentioned above, Herron says, would be in contravention of the Municipal Management Act and be considered wasteful expenditure by the Auditor General. The SJC and Ndifuna Ukwazi have gathered submissions from residents of informal settlements reiterating the fear that is felt by those using temporary toilet facilities at night due to the risk of being robbed or raped. “By saying that no more toilets can be built, the City is effectively stating that this administration is not prepared to take the necessary steps to fulfil the right to sanitation for residents of informal settlements,” says Rossouw. Rossouw is sceptical of the idea 82% of informal settlements fall on land that cannot support water or sanitation infrastructure. Activists believe that at the heart of the City’s approach is the classification of Cape Town’s informal settlements as fundamentally temporary, hence the prioritising of short-term (often very expensive) sanitations solutions as opposed to long-term infrastructure. This is particularly unreasonable, they say, because 80% of informal settlements are older than 10 years. The City of Cape Town’s budget is currently only a draft; it is due to be tabled on 29 May. Activists hope that by sparking discussion on its contents ahead of time, changes can still be realised. Rossouw says it’s not just about securing more public money for infrastructure.